Your trusted air conditioning contractor has the right controls for your needs. Jamie's Air Conditioning and Mechanical Services LLC. is an established air conditioning contractor dedicated to enhancing the level of indoor comfort control for our customers. One way we do this is by offering the latest in thermostats and control systems. 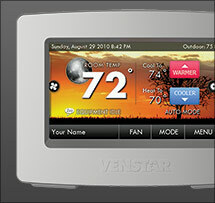 A programmable thermostat allows for efficient heating and air conditioning. With a thermostat that offers 7-day programming, you'll never have to worry about leaving the air conditioner running on a hot Arizona summer day when no one is at home. We also provide thermostats that can control indoor air quality components (like humidity levels) and provide remote access, so you can adjust the temperature in your home from your phone or computer! We are committed to providing our Arizona customers with industry top product and services. For more information on commercial HVAC service, call us at 623-451-8921.